We have been testing the online handicap system from GolfSoftware.com now for the last 6 weeks on a 60 day free trial basis. 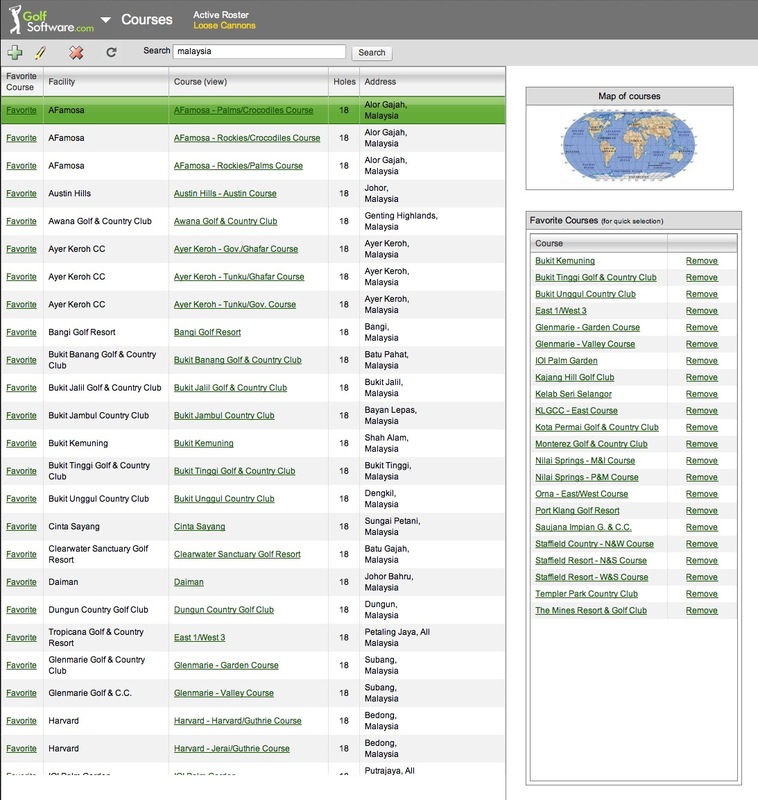 This online system provides an easy to use and comprehensive handicap management system for a large group of golfers. 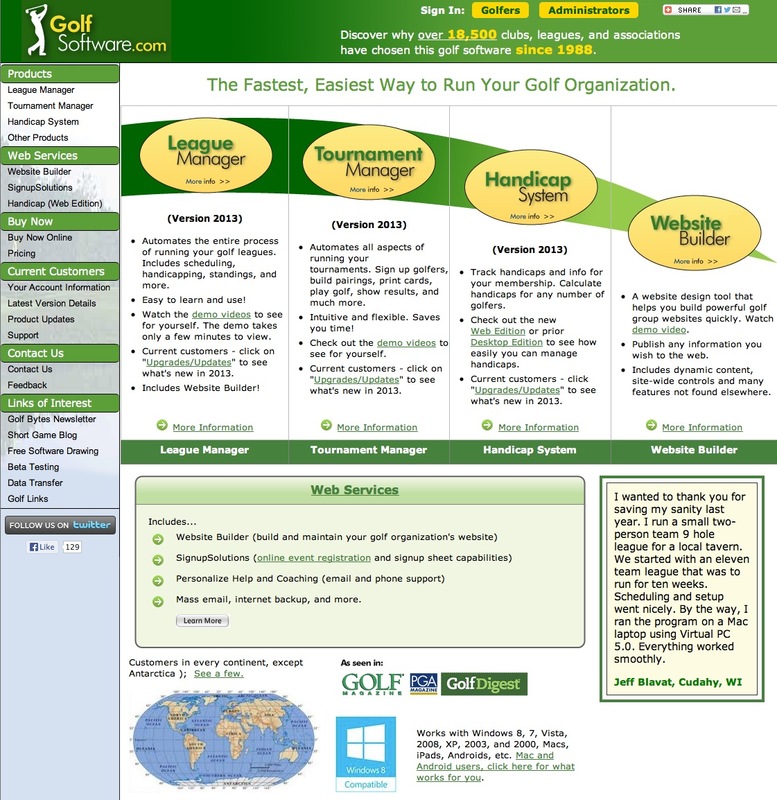 The advantage of this online system is the ability to have a number of Admins who can update and input golfer information and scores and is not dependent on a single computer installation of the software. Also it allows all golfers in the group to access their golfing scores and statistics and print out their updated USGA handicap which is obviously very useful when playing at other groups or golf courses who require an “official” handicap card. 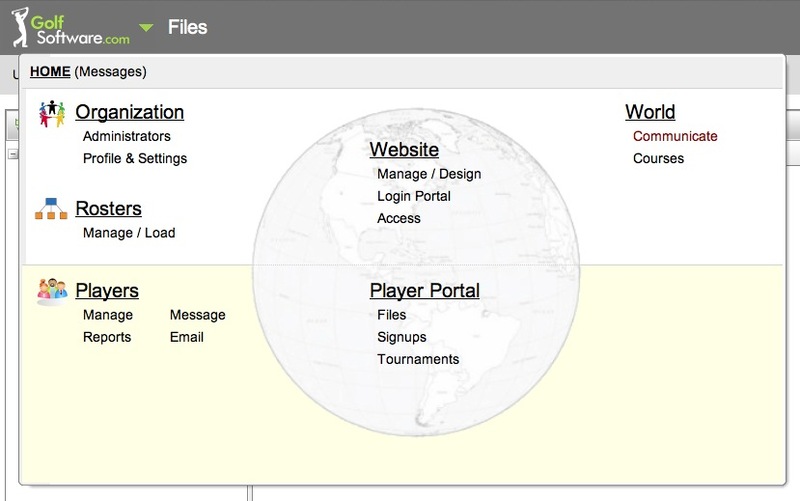 The GolfSoftware system has a large database with detailed course information. 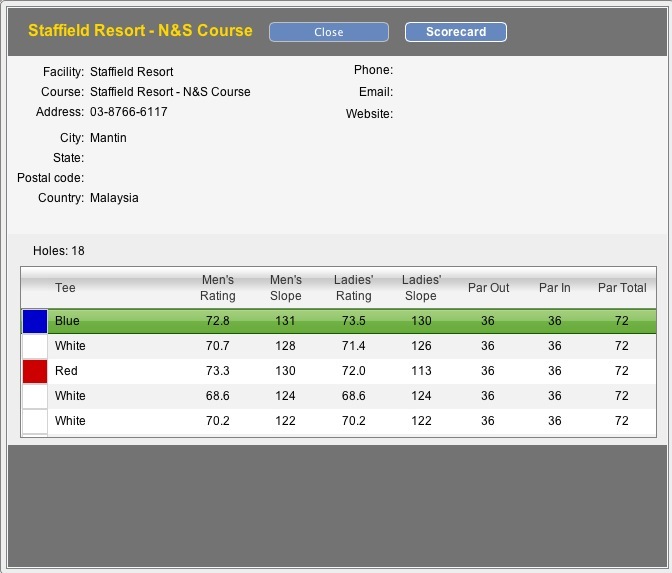 There are already many golf courses in Malaysia on the system with full details of rating and slope for each course and each tee position. However if the course is not in the system you can add or edit courses with all the relevant hole distances, par, index and course rating and slope. Up to 100 golfers can be entered into the system so individual golfer information and scores can be maintained. Different rosters can be used so for example you may have different groups that you manage so the system can handle this. In our case I have an active Loose Cannons roster with an additional roster for players who are not active. Individual scores can be entered for each player with course played, date and gross score. Once player information and scores are entered you can calculate the handicaps of all players (or individuals) on a routine automatic basis or d this calculation manually by clicking one button. Individual golfers have the ability to review their scores online and download a copy of their handicap card for printing. 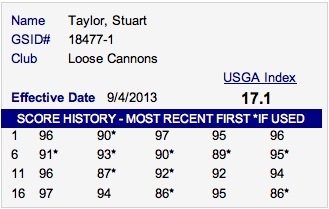 Many useful statistical reports can be generated to track player performance and current handicaps. 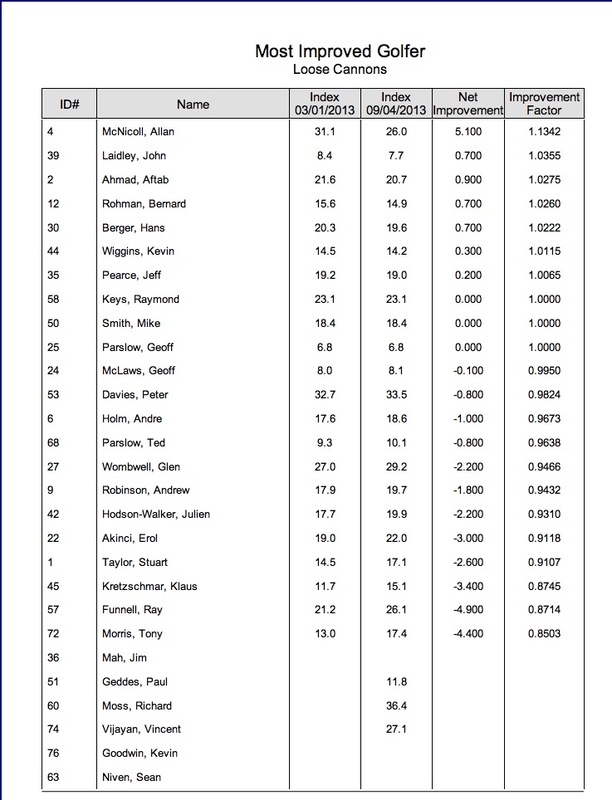 For example the table below shows the Most Improved Golfer over a specific period of time. Custom reports can also be designed for your won use. 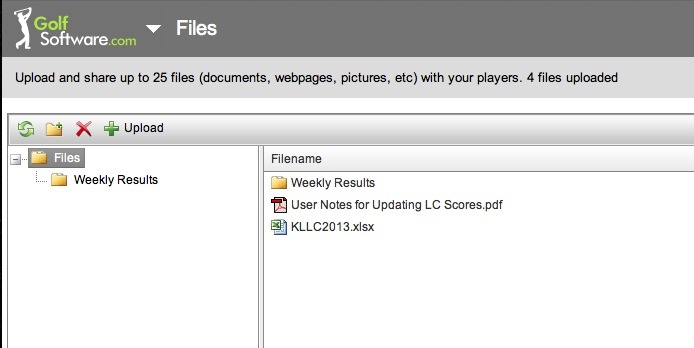 There is also a facility for uploading files onto the system to share with all golfers. 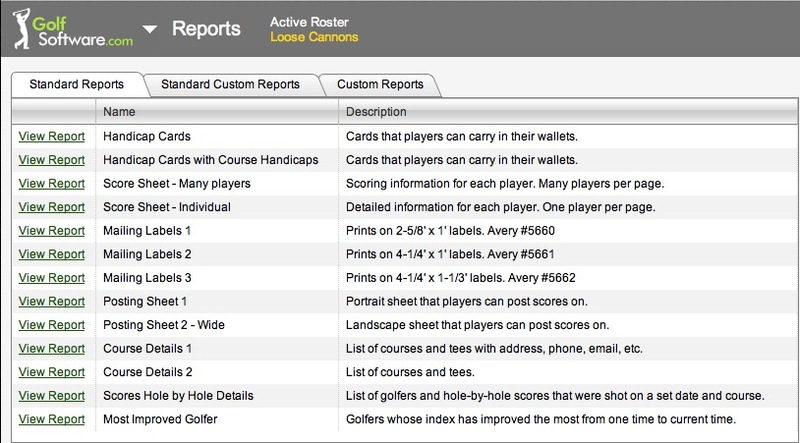 For our group I have uploaded the weekly results for reference as well as the current updated Loose Cannons master spreadsheet with all the player info and handicaps. I also have prepared some user notes for the running of the online system and the updating procedure for the spreadsheet. 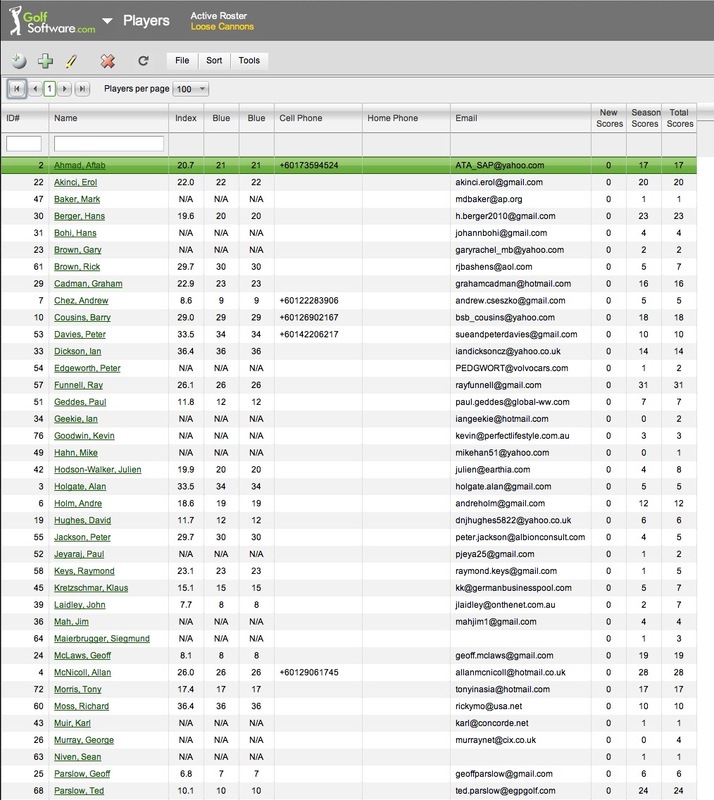 There is a utility to be able to mass e-mail all the players in the roster or message them which is useful for the routine sharing of information or sending updates. I believe that this online web system from GolfSoftware is an ideal method to track all our golfing activities and importantly calculate an official USGA handicap for all players on a routine basis. In this way there can be no arguments on anyone’s handicap. because it is an online system it is easily accessible by all players and the Admins who will run the system therefore not relying on a single person or single software installation on someone’s computer. There is a web based system (the system we have been testing) or a desktop system. The advantage of the web based system is easy access from many different computers, iPads, iPhones, etc and access by many people. There are different pricing schemes depending on how many golfers to be managed – we would need the 50-100 golfer system. The annual cost for a 100 player web based handicap system is 240USD and I would recommend to the group that we commit to this system for our routine ongoing handicap monitoring and player management.